This Vita57.4 compliant FMC+ module is supported by four QSFP28 (100G) or four QSFP+ (40G/56G) ports and one Ultra-low jitter (90 fs rms) programmable clock generator (Si5341) providing flexible clocks (LVDS, LVPECL, LVCMOS, CML, and HCSL) for serial transceivers of the host FPGA. The I2C bus of the clock generator can be controlled either by host FPGAs or the on board PIC processor. 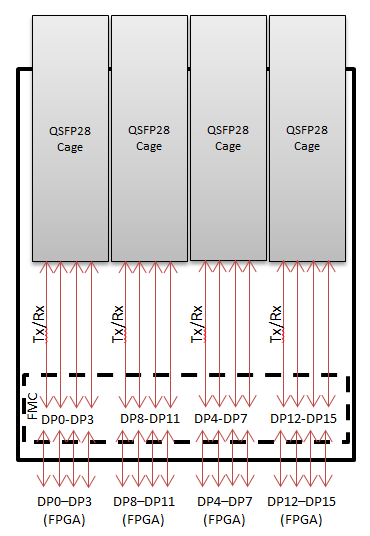 Each QSFP28 /QSFP+ port is directly connected to four multi-gigabit serial transceivers of Vita 57.4 compliant FPGA carrier boards.